This is my husband's favorite curry. Here is the recipe. First chop the eggplants into small cubes. Chop the onion in the same size and soak both eggplant and onion in water with a drop of lemon juice. Take a wide pan, pre heat oil, add mustard seeds, when it splutters add urad dhall, channa dhall and red chillies to it and fry it till golden brown. Now add the chopped eggplant and onion to it. Add required amount of water, add salt, turmeric powder and curry powder to it and let it cook under low flame. Stir it occasionally. Do not mash the eggplant. Turn off the stove when eggplant is fully cooked. Serve it hot with rice. This is also a side dish. Hi, I make similar dish with brinjal but I add garlic an omit chana dal, A note for garlic, it gives a different flavor and yes it is good for heart. 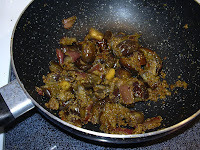 Vidhya of the two brinjal curries, I think I will opt to make this one. When you list 'curry powder' I am a little confused what spices go into this mixture. Is this like 'garam masala' or a homemade spice mix you have made? Thanks.